Here is a quick guide on how to figure out if your frame is compatible with Shimano's new XTR Cranksets. Currently Shimano offers two variants of the crank. Trial and Race. For the Hack Racer in you the ideal setup on a 26" wheeled bike is the Race crankset if it fits. The M985 is 3mm narrower in Q factor than the M980 (I do not know the exact Q factor as calling both Shimano Canada and Shimano USA could not get me an exact number). The Q factor is how wide the crank arms are from outside face to outside face. A narrow Q factor in theory increases pedaling efficiency as well as better knee angle tracing. 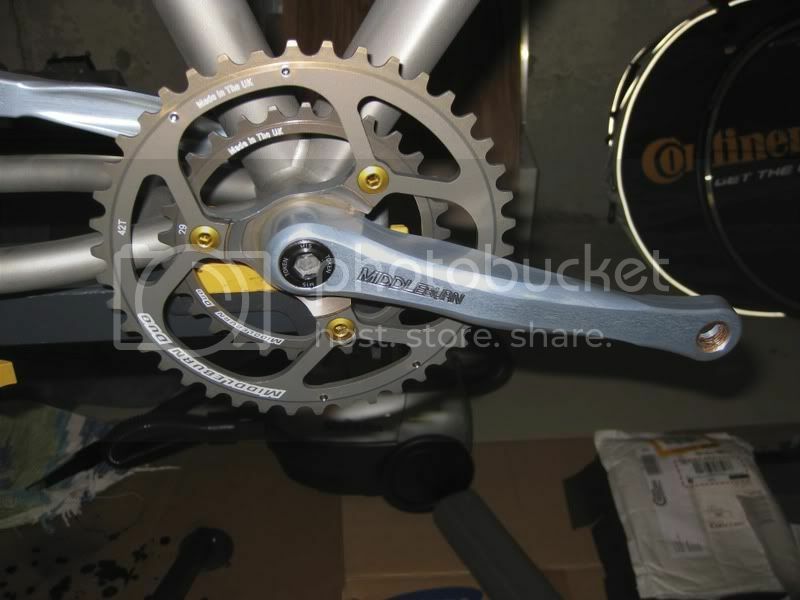 For my bike I was looking on replacing the Middleburn RS8 DUO crankset I had on it for several years. The RS8 was a good crankset but the downfall was the ISIS bottom bracket. 3 years ago Middleburn did not offer their external bearing version. So I was forced to choose between ISIS or square taper. I chose ISIS and went with an American Classic BB which has replaceable bearings. After replacing them every 2 months for 3 years I said enough was enough and decided to run a reliable crankset. With modern day double cranksets they get tricky because the axle is integrated. This means the width of the crankset can not be changed by selecting a different bottom bracket like in the past. Past being ISIS and Square taper, or even Octa-link. So now you need to measure exactly and purchase the correct crankset or else you are stuck. 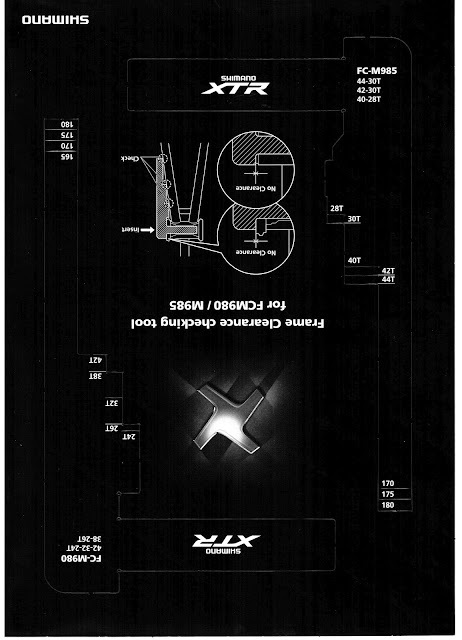 Shimano actually acknowledges that the M985 may not fit on all frames. So they have this paper template. The only cavet is that you have to have the Bottom Bracket (SM-BB90-A) installed in your frame. Luckily I had a spare. Take this template (click here for PDF version). Print the PDF version of the document 100% size with no scaling. Then glue the printout to a stiff piece of bristo-board (the brown stiff paper back on note pads or cereal box or go to Staples). Then cut it out exact. Install the drive (right side) bottom bracket cup from a XTR or XT crankset. Stick the paper template into the bottom bracket and see if any bit of the paper will touch your frame. Once you confirm, you can order what you need.